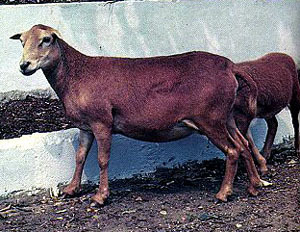 Africana sheep (also known as Pelona, Camura, Red African, Rojo Africana, Colombian Wooless, or West African sheep) are found in Colombia and Venezuela. They are very similar to Pelibuey sheep in size and confirmation. They are usually brown, ranging in shade from tan to brown and cherry-red to dark red. They are is raised for meat and classified as a hair breed.